If Sky did something similar it would take some of the pressure off. Nice, but I would have preferred they post stage 1 or stage 4. As Brailsford himself says "For some, it will never be enough..."
According to PCS, he is currently not pencilled in for either Trentino, or Romandie. Could it be that rather than have a warm up race for the Giro, he'll be catching a last minute flight back, again? At 3 days and presumably just the Naranco? the lightest option available to warm up the legs. I simply assumed he was in Boyaca doing his pre gt training thing. As jensattacks likes to say for south American riders training back home - "away from the police"
Can't be visa issues here, so I guess he is going to repeat his last minute arrival and race the Giro stone cold. Crazy strange, if he does. "As far as I know, the Giro del Trentino is the perfect route to prepare the Giro, but everyone takes his choices"
(gt) "" I'm a very good standard. With good preparation as I have always done. There will be no problem for not doing the Tour of Asturias they were only three days. You get to the Tour of Spain in 2012 without any race before, like the Tour last year, so I think that there is no problem so get to the Giro d'Italia this year. " "The preparation was specified in the last three weeks. I trained quite strong and simulating some stages. Making series and preparing the individual time trial. The expectation is good, I hope to do a good Giro and fight for the title. " "The preparation has been very similar to the Tour de France. They are two totally different careers. In the Tour de France planimetry is much smoother but the level of riders is very high. At the Tour of Italy are almost all climbers and I be one of the mountain much preparation is needed. To prepare the individual time I went out in the time trial bike to work in the position and in series to simulate the time trials of the Tour. " "The idea is to fight for the title. Ask podium. We are not far, you can do because we have a great team with climbers, with runners also go very well for the plain and that gives me peace. " "The wind tunnel was a great experience as many things about aerodynamics worked. We have also changed the position on the bike. We were not far from the one we had before, but we have fixed some small things and have greatly improved. " "The Giro ends practically in the Zoncolan. It is a very hard port, was recognizing but I could not do everything because it was full of snow. Four miles I've been told technicians and colleagues who know that just as is the beginning is the entire climb. It is one of the most complicated ports that I have known in my life. It is definitely the stage that I like the Giro d'Italia ". "Rigoberto Uran going very strong, has good races. We did together Tirreno-Adriatico and walked very strong helping the team leader. Already in the Giro will be jede row of your team and a rival to be reckoned with even Colombian opponent but just is. " "Joaquim Rodriguez had two falls in the Ardennes but apparently is not important and is very well physically. We have already seen Cadel Evans has won the Trentino, rather than many, pulling the peloton when he was alone and arriving with them in no time. It is a very strong rival. Domenico Pozzovivo has been very good in Trentino, was among the first five in the Liege-Bastogne-Liege and is a great climber. There will also be surprise waiting that may appear as always leaving an opponent gives you never before been seen but goes very strong. " "You can always dream what gets us to the imagination. It would be great to make a podium finish with more Colombians and therefore are not far Rigoberto (Uran) was second last year and also Julian Arredondo is very strong, as demonstrated in the Ardennes Classics. Also the Colombia-Coldeportes team with very good runners. Surely going to win some mountain stages and there that does not cost anything to dream ... "
"Train and be the leader of a team is not easy but when there nice legs is less difficult. We work every day to have a very good companions for all to go with one hand and work is not too difficult. It would be frustrating not to finish on the podium but we are human beings, I am very young and still learning. I go to the Giro and I continue to learn every day asking me to come a Tour de France with many more capabilities. " "It's great being a dad. I am very happy. It is a very pretty girl. It is difficult to train and be with her as the face of this type of race preparation is quite demanding and need a lot of help from my wife, then it becomes a little tricky as every child get home and could not sleep well but I lucky as she is very well behaved. " "The Tour de France is the most beautiful race in cycling there but we must go step by step. We can dream that we won but we can also be realistic and I have to finish prepare me. Maybe this year have gone to win as you may not, it would have been a little frustrating for me and for the team. I want to go step by step, with confidence and sure eventually arrive with many options to dispute. " "In the Giro d'Italia the first week you have to be very careful. This is where you can not lose '. They are very narrow roads and quite difficult routes. Where can you get more time to try to win it in the two individual time trials and mountain last week. " "It's very nice to know that there is again a large number of Colombians runners in the heading of this type of racing. Long time did not look like we are now and Colombian cyclists alongside future generation will surely be like at one time they reached 30 Colombians go to a Giro d'Italia and Tour de France. But I go back and I reiterate, the important thing now is to work with young people, as do seed guarantees future. It's what we always talk but nobody answers. " Igor Antón, Imanol Erviti, John Gadret, Iván Gutiérrez, Beñat Intxausti, Enrique Sanz, Sylwester Szmyd & Giovanni Visconti. Alejandro Valverde, Iván Gutiérrez, Jesús Herrada, Adriano Malori, Jasha Sütterlin, Jonathan Castroviejo, Sylwester Szmyd & Giovanni Visconti. Given that Anton, Capecchi, Malori, Herrada and Castro all did the Giro, you can probably count them out of the Tour. Perhaps a line up including Valverde, Gadret, Intxausti, Dowsett, Visconti. Rojas for the inevitable 7th place in the sprints. Sütterlin would be great as a rouler, but maybe too young for a GT where they are hoping to challenge for the win. I see Lastras, Erviti, Szmyd, Gutiérrez and Lobato as more likely than young Jasha. Lastras and Szmyd especially (but also Gutiérrez) are the experienced riders you need for a successful GT team. Ion to race should be kind of a certainty as well I guess?! Oh, I don't disagree. Doesn't mean I wouldn't like to see it . Sütterlin seems to have a cool head, and has been willing this season to cane it on the front Jens Voigt-style. Ho hum, now Valverde's pulling a Quintana. Camping on Sierra Nevada, and not actually racing on his bike until he has to. Can't help feeling that Lance missed a trick there. 11 Alejandro Valverde 33 GT Contender of the team, with the goal of winning the Tour, but the team will/should be happy with a podium finish. 12 Alex Dowsett 25 Able of doing a lot of work on the flat, not scared of a bit of hills either, the Tour start is in Yorkshire as well. 13 John Gadret 34 Very important climber that will help set up Valverde in the mountain and looks to be the second to last guy to drive the pace for Valverde. 14 Iván Gutiérrez 35 While Movistar have more than enough climbers to fill up 3 very good GT teams, the riders for the flat are a bit scarce, Dowsett is probably the best, Gutiérrez is also very good, he takes this spot a few inches over Pablo Lastras who will go to the Vuelta instead if you ask me. Likely the road captain. 15 Jesús Herrada 23 Bringing a bit of youth to the team Herrada has done well this year, at Romandie he won the youth competition, he should bring strength to the team both in the mountains and on the flat. He will not be the best dom either place, but he can be used both places. Picked ahead of Sylwester Szmyd who has looked a bit to the weak side after leaving Liquigas, Szmyd will have to settle for the Vuelta. 16 Beñat Intxausti 27 The backup for Valverde in the GC and last man for him in the mountains. Has a top ten in the Vuelta in 2012 one in the Giro last year, and could well add one in the Tour this year. 17 Jon Izagirre 25 Has been going well this year, and was one of the three riders the team managed to place in the top 10 in Romandie, brings good climbing but has enough all-round skills to help the teams on the flat if he needs to as well. Chosen above Rubén Plaza for this spot and job as Ruben pre 2011 results looks more like the fluke than the last few years results, Ruben is likely to be found riding support for Quintana in the Vuelta. 18 Juan José Lobato 25 A close call between him and José Joaquín Rojas, but this year Lobato has looked better and he has 3½ year on Rojas. Really I think it is a competition at the Tour de Suisse for who gets to bring sprinting to the Tour. It should be noted that neither is really expected to get anything but a couple of placings, while the loser of the battle is likely to ride the Vuelta, where the best sprinters does not normally enter. Rojas could win in Spain later on if he as predicted misses the Tour. 19 Giovanni Visconti 30 Visconti has never ridden another GT than the Giro, that will be until this year. The Italian will look for yellow on the 2nd stage, he gives the team a strong rider that is likely to come away with a stage win. 12; Alex Dowsett; 25; ; Able of doing a lot of work on the flat, not scared of a bit of hills either, the Tour start is in Yorkshire as well. Was more thinking the other way, an English tour start meaning Movistar is more likely to pick him, I can't see them letting him leave the peloton on that stage though, will probably have to work to keep Valverde in the right place on that stage. Yeah, I would agree with all of that. I think given his development, he would have been in with a good shout of a place on the Tour team even without the UK start. Certainly if you said 9 best riders on Movistar in a GT team, I think he would be in. 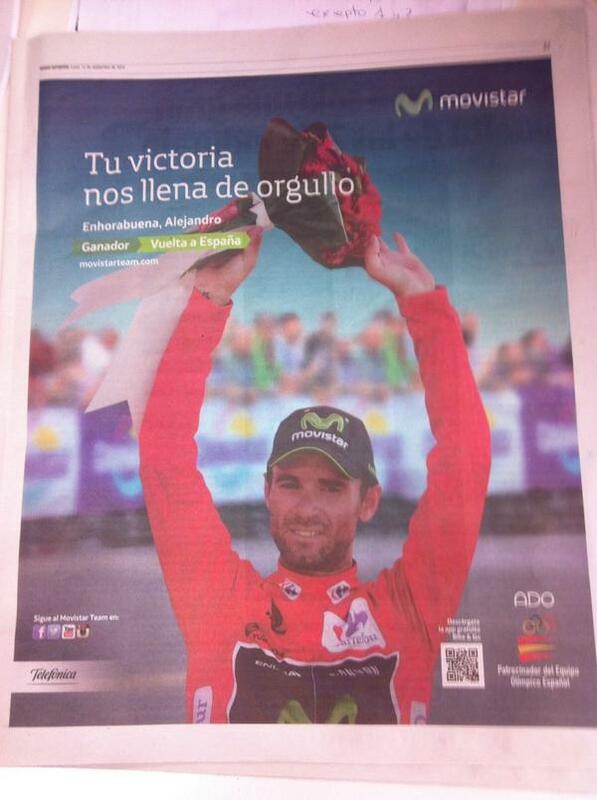 I would have thought hard about letting him do Giro-Vuelta instead if I was Movistar though. First of all Quintana winning those is way more likely than Valve winning tour imo, so makes sense to support Quintana best. Secondly he would have better chances of winning an ITT that way. Third his ITT strengths could be utilized in the TTT's of those tours. I suspect some sentimentality came into it. He did the Giro last year and won the ITT. They have Malori as well for ITT stages (although him crashing the day before it this year didn't really help), as well as Castroviejo. So take Malori to Italy and let Dowsett ride UK/France. It will be an interesting challenge to see how he copes with the Pyrenees right before the long ITT stage. Certainly he'd have had a better chance at winning the Giro ITT... but plus çe change or whatever they say in Yorkshire. Through no fault of the team, the following advert appeared in the Spanish press yesterday. The team, and its sponsor, apologised, clarifying - for any Spaniards not aware - that it was, in fact, Contador who won the Vuelta. Alejandro Valverde has renewed his contract with Movistar until 2017. ""I'm supper happy. This was just what we both wanted: Eusebio wanted me to stay, and I wanted to keep wearing these colours. At the end of the day, this is my home and we get on with each other well. I feel better than when I was 25; seasons seem shorter to me because I'm able to cope with pressure better. Being more mature makes you more calm and helps you see things differently." "He's an incomparable rider. There's not one able to keep as much focus and willingness to win through the whole season like he does. He performs just like the best and gives us lots of reasons to keep supporting him every day. Though he's spent so much time at the top, he shows us to be feeling like a 25-year-old. He's superb." Three year deal. Very nice and increasingly unusual in these times of one-year extensions. That said, he does add value. Moreover, I reckon Valverde will be riding even longer than that if he can. Seems like the sort of guy who will go on forever. Pablo Lastras, who started his career with Banesto Amateurs in 1995, and has ridden for the professional squad in all its incarnations since 1998, has signed a one year extension to his contract. Maybe unsurprisingly it looks like both Quintana and Valverde will do the Tour/Vuelta combo. Leaves a nice opportunity for some of their team mates to shine at the Giro in their stead.